Ready to Broc and Roll with the veggies? 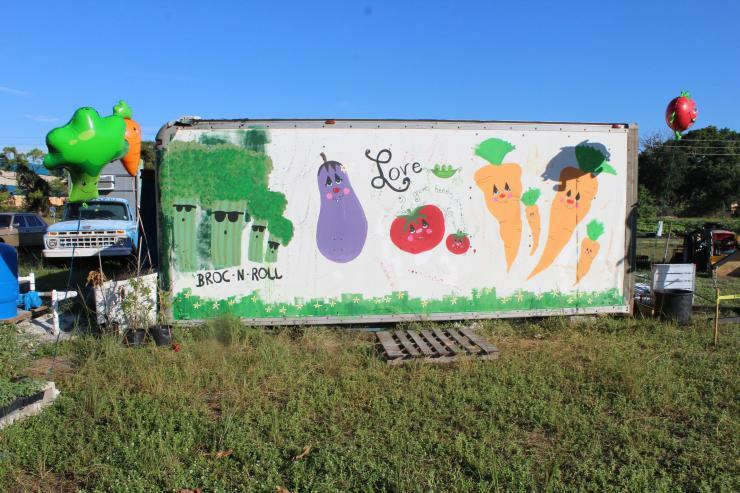 A trailer located on Marian Center property in Miami Gardens sports a produce-themed mural painted by students and clients. The center has the first and only organic urban farm on archdiocesan property, and Marian Center clients assist with the harvest and care. It was blessed Nov. 20 by Archbishop Thomas Wenski. 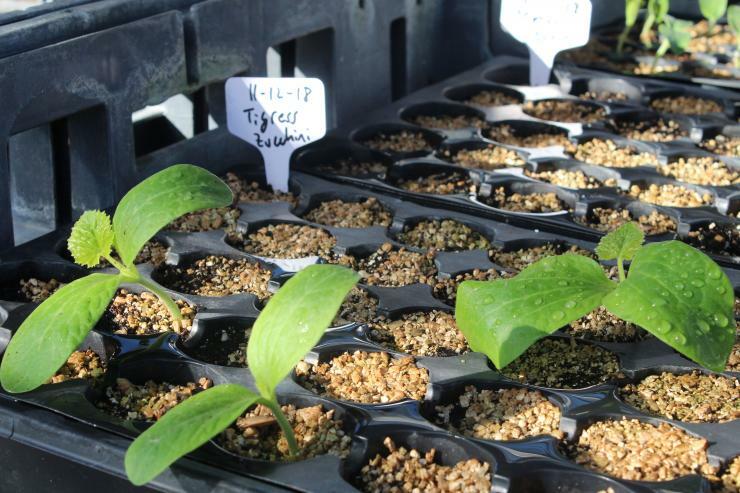 An up close view of the tigress zucchini sprouts already growing in the nursery at the urban organic farm the Marian Center. 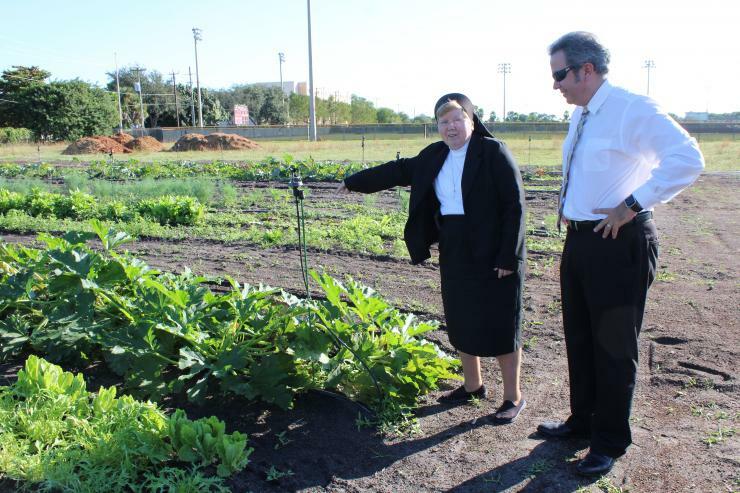 Sister Elizabeth Worley, of the Sisters of St. Joseph of St. Augustine, archdiocesan chancellor for administration and COO, points out the progress of the harvest to David Prada, director of the archdiocesan Building and Property Office. 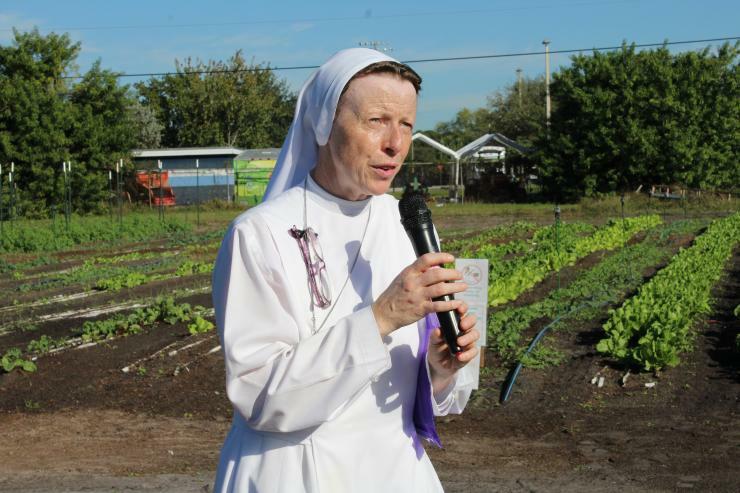 Sister Lidia Valli of the Sisters of St. Joseph Benedict Cottolengo, the Marian Center's executive director, says a few words before the blessing of the field and urban organic farm on the grounds of the Marian Center. 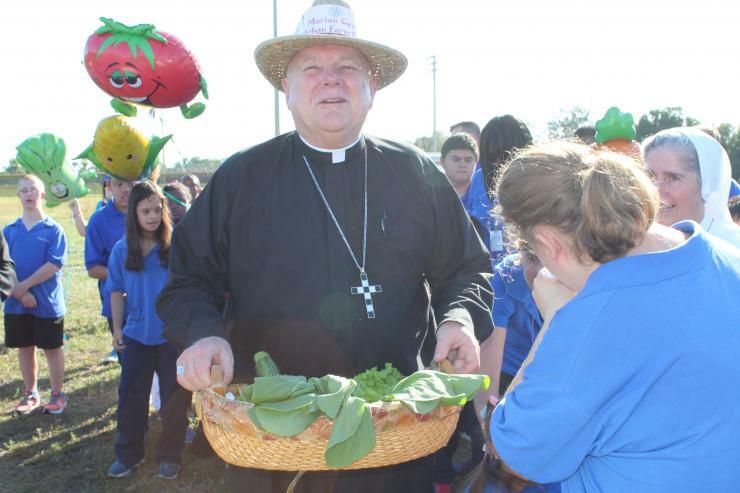 Archbishop Thomas Wenski blesses the fields of the urban organic farm now on Marian Center property. Smiling in the crowd is Moses Kashem, right, the main farmer and founder of St. Simon's Farm and the Urban Vegetable Project, who will be working with Marian Center students and clients during the harvest. Archbishop Thomas Wenski says a few words after blessing the field and urban organic farm at the Marian Center. Assisting him is the Marian Center's Adult Day Training client Christopher Abreu. 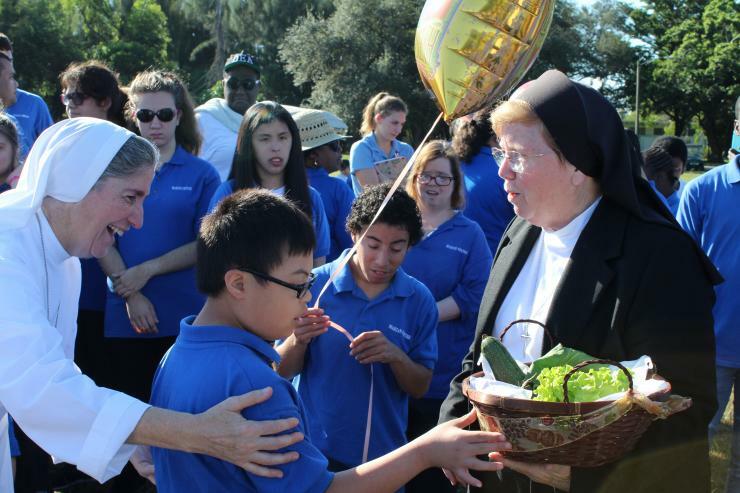 Sister Lidia Valli, left, and Sister Filomena Mastrangelo, along with staff from the Marian Center, help student Ariana Fortuna hold on to the gift basket of veggies grown at the urban farm that was presented to Archbishop Thomas Wenski. (COURTESY | Sr. Elizabeth Worley) Marian Center student Ariana Fortuna carries the gift basket of veggies grown at the Marian Center that was presented to Archbishop Thomas Wenski. (COURTESY | Sr. Elizabeth Worley) Surrounded by Marian Center students and clients, Archbishop Thomas Wenski accepts the gift basket of produce grown at the center's urban organic farm. Sister Filomena Mastrangelo, left, of the Sisters of St. Joseph Benedict Cottolengo, guides Francis Ferrer as he presents Sister Elizabeth Worley, archdiocesan COO, with a gift basket filled with organic produce grown at the Marian Center's urban farm. 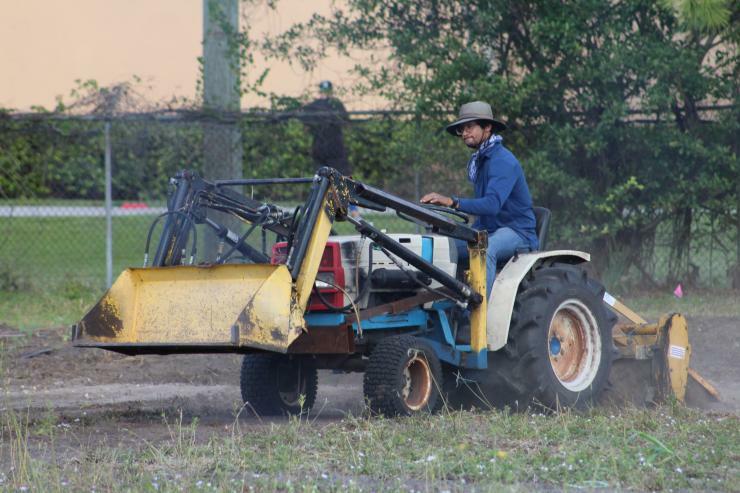 Happy farmer Moses Kashem rides a tractor as he prepares the Marian Center's land for more urban farming. The farmer's wife, Erin Kashem, examines some of the produce leafs. MIAMI GARDENS| Omar Raad likes to get his hands dirty. The kind of dirty that comes from the soil he farms at the Marian Center’s newest campus addition: a two-acre, USDA-certified, organic urban farm, the first and only one of its kind on any archdiocesan property. “I like growing vegetables. Look, the lettuce is growing,” Raad says as he points to the fields where not only is the leafy green visibly growing, but also an assortment of other produce like kale, bok choy, zucchini, tomatoes and more. “We can put Ranch on the lettuce,” added Christopher Abreu, another Marian Center farmer. Both Abreu and Raad are clients of the Marian Center’s Adult Day Training program, which provides recreational, social, occupational and vocational services to individuals with intellectual and developmental disabilities over the age of 21. Urban organic farming is the latest addition in educational and training opportunities. 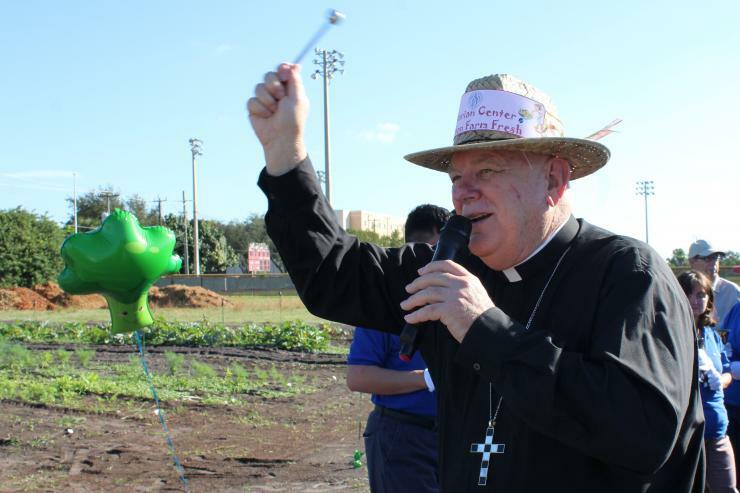 On Nov. 20, Archbishop Thomas Wenski blessed the grounds and crops at the Marian Center, which is located just south of St. Thomas University in Miami Gardens. Happy farmer Moses Kashem rides a tractor as he prepares the Marian Center's land for more urban farming. 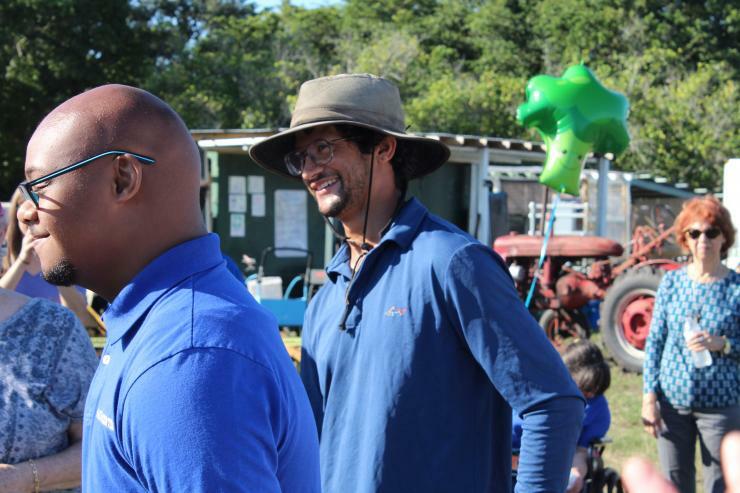 Also helping the plants and the project grow is head farmer Moses Kashem, founder of St. Simon’s Farm and the Urban Vegetable Project in Miami. Both community-supported agriculture programs link consumers directly to locally grown food. St. Simon’s produce is available at Whole Foods Markets around South Florida and is used by MiMo’s Pinch Kitchen and other restaurants. Kashem — who describes himself as part of a newer wave of young farmers who believe in combining social activism with agriculture — had never heard of the Marian Center. 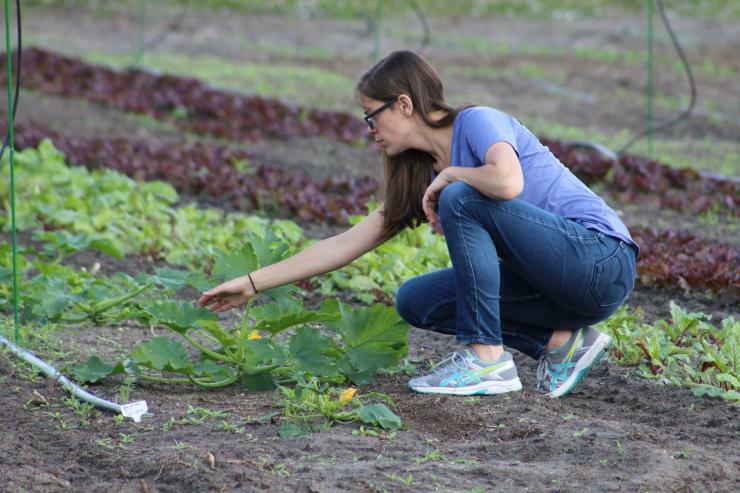 Fogarty, the mother of a Marian Center client and member of its PTA board, had read in the Miami Herald about the urban farm at St. Simon’s Episcopal Church. “I saw this article about a farmer named Moses and how he’s growing in a little church nearby and I said, ‘We can do that. We have land. And the adults can work it,’” Fogarty recalled. As a farmer, Kashem looks for long-term stability in land because of the time, infrastructure and cost required to set up a farm. “I was looking for professionalism on the end of the landowners so that they knew how to make a strong lease,” he said. The lease with the Archdiocese of Miami was negotiated and approved earlier this year. The documents and permits required for farming and agriculture were also acquired, including a USDA seal of approval for organic produce. Archbishop Thomas Wensk says a few words after blessing the field and urban organic farm at the Marian Center. Assisting him is the Marian Center's Adult Day Training client Christopher Abreu. Because the Marian Center is not located in a typical agricultural area, the texture of the dirt is sandy, and required additional composting and nutritional work. Slowly but surely the texture changed, and now the soil is rich and ideal for planting. Growing up in Cutler Bay as the middle child of a Bangladeshi father who liked to farm, and an Italian mother who worked as a nutritionist, Kashem and his family learned the value of reaping what they sowed quite literally: from the farm in their backyard. As an adult, he earned a Bachelor of Science in biology from Florida International University, and even considered a career in the medical field. But something was missing. His wife, Erin, whom he was dating at the time, also noticed. “I could tell that he wasn’t motivated by it, and yet every time we would go for a walk at a different place he would point out the different plants and what they were good for,” said Erin. Kashem went to work for the USDA as a horticultural specialist, and that’s where he realized his true calling as a farmer. In July, he started preparing the fields at the Marian Center. Along the way, he worked with three or four Marian Center students at a time, harnessing their green thumbs. “They’re really nice individuals. I’ve had fun so far,” he said. 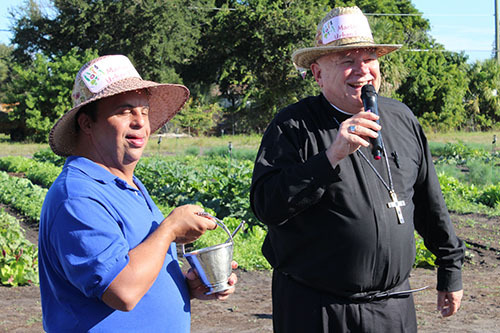 The contract with the archdiocese calls for a portion of the produce to go to the Marian Center, as well as the training and supervision of clients and volunteers on farming. 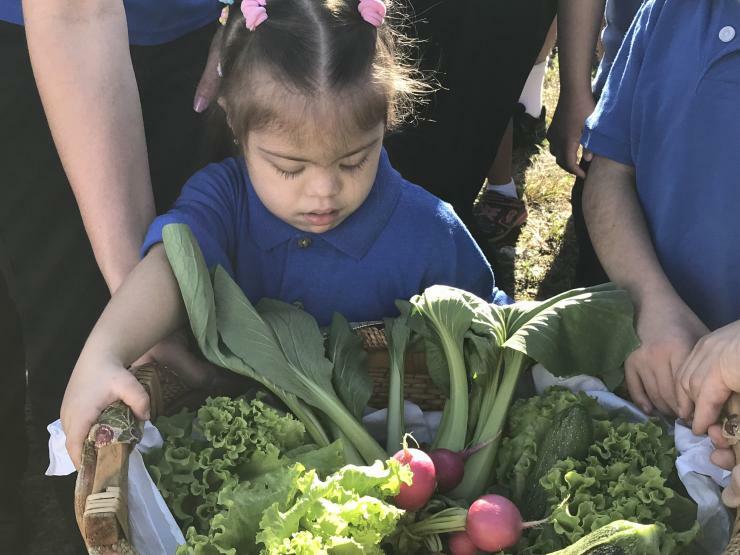 In fact, after teaching them the necessary skills, Kashem intends to employ Marian Center clients, becoming the only farm of its kind in South Florida to hire adults with intellectual disabilities. 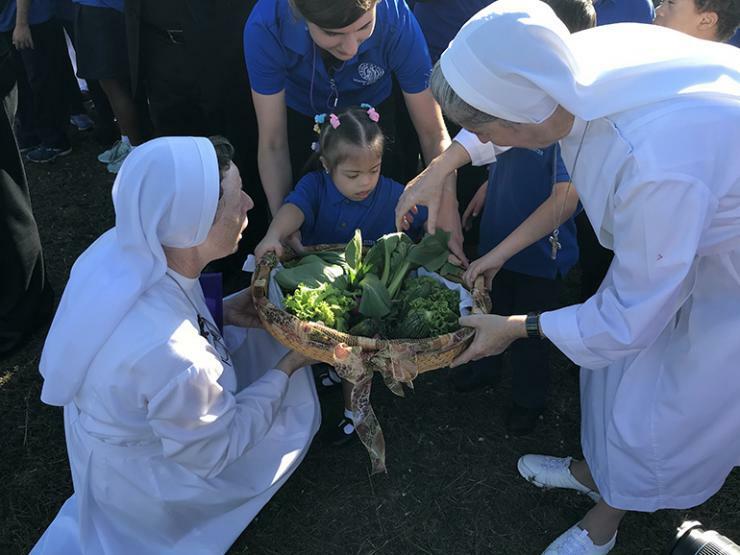 Sister Lidia Valli, left, and Sister Filomena Mastrangelo, along with staff from the Marian Center, help student Ariana Fortuna hold on to the gift basket of veggies grown at the urban farm that was presented to Archbishop Thomas Wenski.